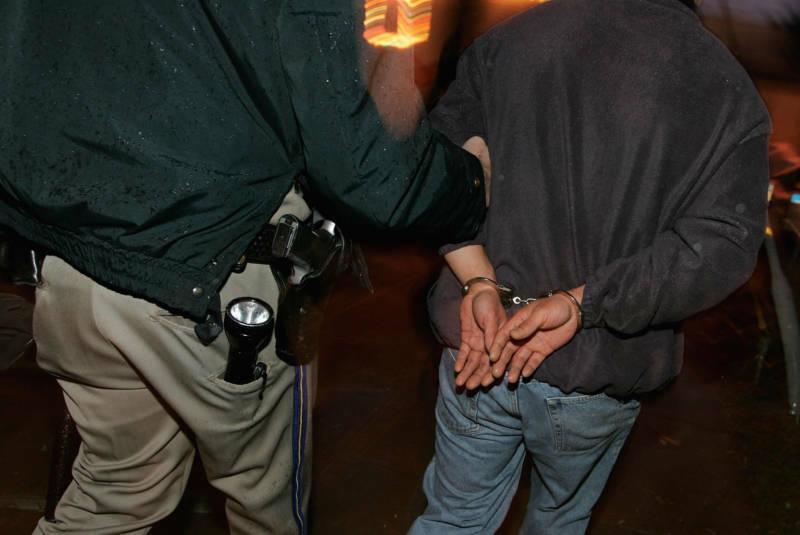 Arrest rates in California are the lowest they've been in nearly four decades, but African-Americans continue to be arrested at a disproportionately high rate across the state, according to a new report released Monday evening. Report co-author Magnus Lofstrom says he hopes the data in the Public Policy Institute of California's latest analysis can be used as a starting point to finding solutions to those inequalities. "The first step here in moving us toward solutions and less disparity is to create this shared understanding of the facts," Lofstrom said, "and that's how we can frame constructive, solutions-oriented discussions." Lofstrom and his colleagues studied arrest data from 1980 to 2016, and found rates had fallen 58 percent from their peak in 1989. The PPIC analysis determined that drop was driven primarily by a sharp decrease in the number of misdemeanor arrests and the rate of arrests of young people. The rate for kids 17 or younger dropped by 84 percent, and it went down 63 percent for those ages 18 to 24. "We don't just see a drop in juvenile crime — juvenile crime has fallen off the table in California," said Mike Males, senior research fellow with the San Francisco-based Center on Juvenile and Criminal Justice. "But the thing is, we don't actually know why it occurred." There are several possibilities, including an evolution in how the state handles young people accused of crimes. In the mid-1990s, Congress required states to deal with disproportionate numbers of incarcerated youth. At the same time, California began shifting responsibility for juvenile offenders to the counties. And in 2007, California counties were allowed to commit only the most serious young offenders to state facilities. "We really need to study these trends more than we have," Males said. "We haven't given sufficient attention to why they occurred." 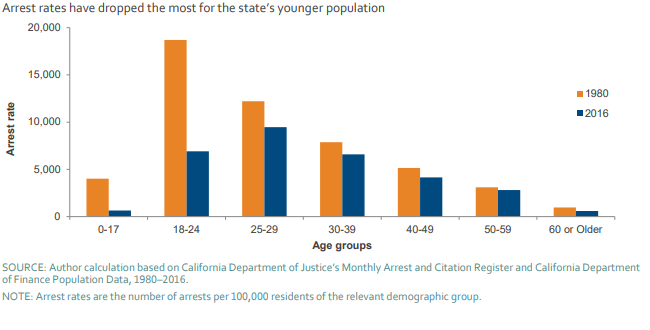 The flip side of the drop in youth arrests is that, according to the report, two-thirds of arrests in 2016 were of individuals between the ages of 18 and 39, though these age groups made up less than one-third of the population. "I think it's been recognized that really we're shifting from an urban gang violence problem, which dominated all the news and attention in the 1990s, to an older, chronic drug-abusing population," Males said. According to the data, rural counties like Lake, Siskiyou and Shasta have the highest arrest rates, while more urban counties like Riverside, Santa Clara and San Francisco have the lowest. The report found a decline in arrest rates across all age, gender, and racial and ethnic groups, with African-Americans seeing the largest decline of about 12,000 fewer arrests per 100,000 African-American residents in 2016, compared to the high in 1989. Felony drug and property arrests of African-Americans fell dramatically, fueling the overall decline. Arrest rates for African-Americans in 2016 were three times higher than those for white people, down from a peak of 3.6 times higher in the early 1990s. Those disparities hold true across the state, with at least 45 counties having an arrest rate for African-Americans that is at least double that of its white residents. Some counties — like San Francisco and San Mateo — have differences of eight and nine times, respectively. "We still see racial disproportion. A lot of it is due to poverty," Males said, noting that poorer whites also have higher arrest rates. "So it's partly racial, partly poverty. And it again points to the need for California to do something in a serious way about our income disparities and poverty disparities across the state." Overall criminal justice policy in the state has varied widely over the course of the decades captured in the report, from tough-on-crime policies in the 1980s and the state's three-strikes law passed in the 1990s, to more recent reforms like Proposition 47, which passed in 2014 and reclassified many drug felonies to misdemeanors.